Do You Know Your Target Audience as Well as the Tourism Folks in Jerome, Arizona Do? Some places advertise their sunsets or beaches. Others promote their hiking trails. Or local wineries. Or ski slopes. Or great shopping and nightlife. The historic (and, some say, haunted) mining town of Jerome, Arizona welcomes visitors with the announcement, “ROAD OPEN 365 DAYS A YEAR.” What a great example of knowing your target audience! Jerome, Arizona certainly has more to offer than a year-round road. The colleague who visited Jerome recently and noticed the sign pictured here tells me of unique shops (including the world’s largest kaleidoscope store! ), ghost tours, a historic movie theater, wine tasting rooms, and art galleries. And if you like views, well, you’re a mile high perched on a steep hill overlooking Northern Arizona. Yet it’s the road’s year-round accessibility that officials chose to promote above all else. That’s because the many motorcyclists and RVing snowbirds who visit Jerome want to know that information before heading straight up into the hills. 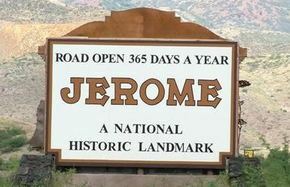 No point in promoting Jerome’s interesting history and fun activities if people take one look at the road up to a town that can’t even be seen because of low winter clouds and say, No way! Do you really know who your clients and customers are most likely to be? And is your advertising as spot-on in communicating to those people what they need to know as the welcome sign to Jerome, Arizona is? When every dollar counts, it should be.